There are different teachers with different accents delivering the Spanish lessons at Spanish Pod 101. Despite that they are mainly divided in Mexican and Castilian Spanish (ie from Spain) and formal and informal Spanish, you will also listen to conversations in Argentinian, Cuban and Venezuelan accents, to give you a few examples. 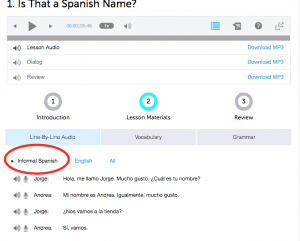 You will be able to see what type of Spanish is being used under the “Line-By-Line Audio” tab, on “Lesson Materials”. 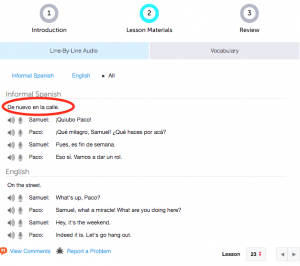 On Spanish Pod 101, you will be able to distinguish what type of Spanish is used in different types of conversations and how to differentiate it. Here is an example. You can see at the top of the dialogue it says where the conversation is taking place (en la calle, on the street). Then it gives you the type of Spanish used: Informal. Now you know that if you are on the street and meet a friend, it’s ok to use informal Spanish. 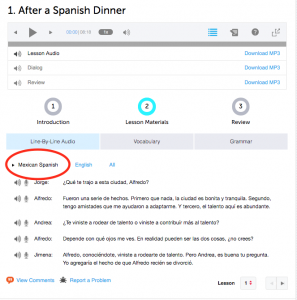 Not only will the Spanish lessons on Spanishpod101 show you what form of Spanish is correct depending on the situation, it will also teach you about culture and customs. 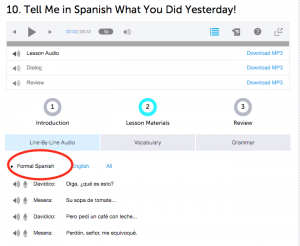 You can browse through the Spanish lessons to find certain celebrations, customs, festive days and holidays to learn more about them. You will see Spanish Lessons that focus on art, like the one about El Greco, a famous Spanish Painter. So, as you see, Spanishpod101 offers you more than just learning the language. It will also teach you about culture and costumes through well-designed lessons that will take you along traditions, local artists, musicians and cooks. Yes, you will even learn about spices and recipes and buying the required ingredients. Spanish pod101 knows that learning Spanish is not only about learning the words but also about the magic of knowing how and where to use them, and about the life styles of the country that speaks the language we are so eagerly trying to learn. Many people find that learning Spanish is hard and you either end up bored or the programs to be too complicated and hard to learn. Spanish Pod 101 is an antidote to this and wants to make things as simple as possible!